Before you go to bed tonight make sure to turn your clocks back one hour. Gaining an extra hour surely sounds nice to exhausted parents, but don’t be fooled. Using that extra hour to let you and your child sleep in can throw off their entire sleep pattern. One hour in my day goes by so quickly I would never think it could have that big of an affect, but to a child it’s a significant change. Daylight savings time can adversely affect your child because when their sleep cycle is disrupted so is their mood. So how do you transition your child to the time change and avoid the crankiness? If you want to let them sleep an extra hour (because you’ll surely want to), don’t! You can let them sleep an extra 30 minutes, but it’s important to get them up and on track. Chances are they’ll be up too early. Encourage them to stay in bed, even if they aren’t tired they can rest until it’s time to get up. You need to keep their bedtime, wake time, and naps consistent. Establishing a sleep routine is hard enough, but now there is something disrupting that precious time. Even though the clock will say differently, don’t let your children go to sleep an hour later. That one hour is a big change for a child, so gradually push it by 15-30 minute intervals. If their bedtime is 8 PM, put them in bed at 7.15 or 7.30 pm and let their body wind down. Read extra books or snuggle. Keep their bedtime routine the same-make sure it’s a calm environment so they understand it’s almost time for sleep. 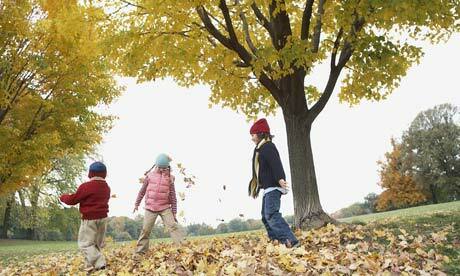 It can take children anywhere from a few days to a week to adjust to the fall time change. This is because a child’s body clock doesn’t follow an actual clock, it is set by light and dark patterns. That is how their brains cue them. This is why DST can be confusing to them. Pay attention to their internal clock. You don’t want to miss the window when their sleepiness peaks. Just take into account ahead of time that the change isn’t easy for them. It is much easier as an adult so it can sometimes be hard for you to relate. They will be getting less sleep, but only for a short period of time, so bare with them. Crankiness is normal. Most importantly remember the importance of sleep. A good nights sleep for a toddler is necessary. Don’t stray from their bedtime routine. Break out the rain boots and jackets and welcome your child to fall. Leaf piles and puddles, how exciting to be a child! ← Shy Kids – Introvert or Real Problem?